In Leopold’s Eulogy of the Marsh, he lamented on what looked to be the loss of the sandhill crane. Since 1948 when A Sand County Almanac came out, we have seen a dramatic rise of these inspirational creatures. I miss hearing their bugel early in the morning from the Wisconsin prairies. Well, slowly they are starting to get a leg hold in NYS. 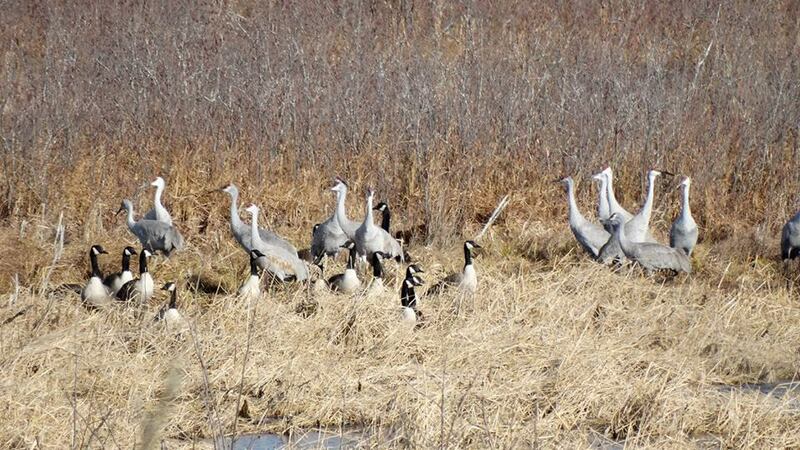 For the past few years sandhill cranes have nested in Waddington and Tupper Lake New York. There has been a perennial pair in the Montezuma Wildlife Refuge in western NYS for years, but they are finally moving our way. 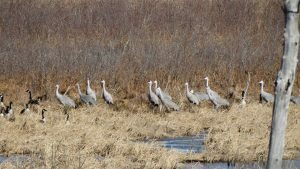 On the 29th of November, I made a run 18 miles north of my house to view a flock of 32 on the Lac-Franaois Wildlife Refuge just north of the border in Dundee, Quebec. I must say it is awesome the sounds of crane bugles echoing around the north country. Coming into the season we had high hopes for smashing our season high record of 82 owls. Unfortunately, Mother Nature had other plans and we had 9 days of rain in the 12 most important days of the migration. We did band a respectable 45 owls though and we even caught a banded owl from Carsonville, PA (4 year old female) and from Cape May, NJ (3 year old unknown). Three of our birds popped up in various places too. One in Valhalla, NY (a hatch year female) this is the second bird we sent them in the past 2 years. Our second one ended up in Mount. Holly Springs, PA (2 year old female banded in 2015) and our third return came from Pennington, NJ (2 year old female banded this season). We are only 5 owls from 300. Overall, it was a good season. 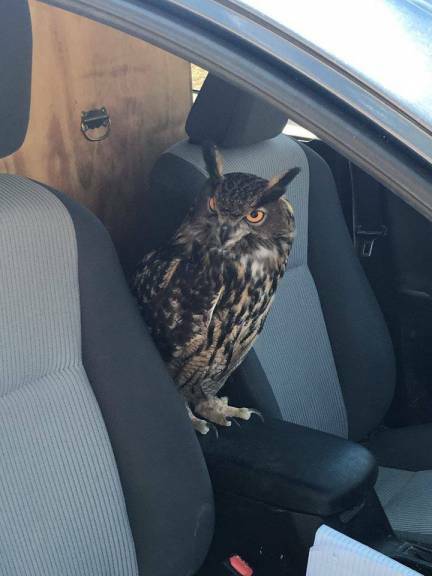 I picked up Morley, my Eurasian Eagle Owl from Rick West when he was 13 days old. Through the past 15 months we have driven tens of thousands of miles together. 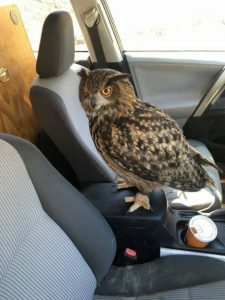 During these rides, Morley sits on the arm rest, back of the passenger seat, back of the driver’s seat, or on his perch in the back seat. Needless to say, we draw a lot of interested looks going down the highway. We have gone through traffic detours and highway checkpoints where the police officer was completely flabbergasted by his presence. Every so often, I glance over while stopped at a traffic light and see awed faces plastered against the windows of cars beside mine as the people stare in disbelief. During our rides throughout the countryside, Morley stares out the window at the passing landscape. He bobs his head and stares at objects that grab his attention. Crows and rode signs particularly interest him. With the 15th season under our belt, it is time for a little reflection. During the season we banded an additional 195 chicks which brings us up to 1739 chicks that reached banding age. When we first started we had 51 kestrels on the study area and during the last 2 seasons we have been hoovering around 400. The American kestrel is the smallest falcon in North America and since 1966 its numbers have dramatically declined throughout the continent. They are many thoughts on what is causing this decline, but nothing definitive at this time. The 4 factors that are thought to be negatively impacting the population is 1) loss of habitat (grasslands), 2) lack of cavities (they are secondary nesters), 3) increase in the Coopers Hawk population (they grab fledgling kestrels), and 4) a possible chemical contaminant. I feel that our area has drastically increased in numbers because we 1) have plenty of habitat and the Amish are creating more every year, 2) 150 nest boxes eliminated the affects of the lack of natural cavities, 3) Amish do not spray as much as traditional farmers, and 4) we have a large population of nesting northern goshawks in the region and it may be keeping our Coopers Hawk numbers in check. 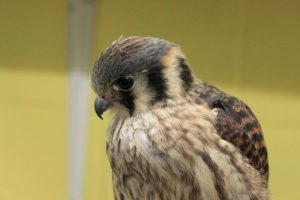 The gos may not focus on fledgling kestrels, but it will focus on Coops. 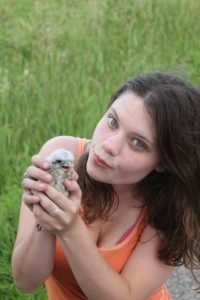 We are hoping to band our 2000th kestrel chick next season. After two winters, Project SNOWstorm has accomplished a lot — and we’re getting ready for another winter of work. So far, this winter has been a lesson in the complexities of Snowy Owl dynamics. There was an early movement of owls into the northern prairies and western Great Lakes, many of which have shown signs of food stress. 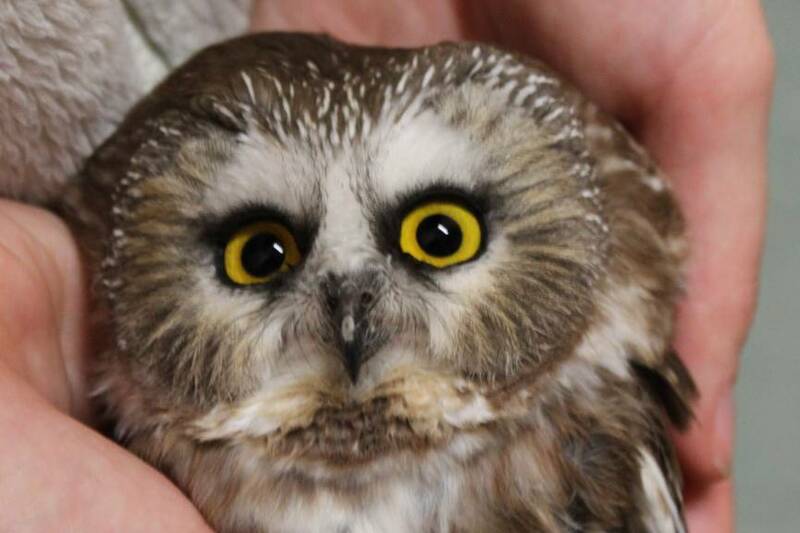 Notable numbers of those weak owls turned up at rehab centers in Wisconsin and lakeshore locations like Marquette, Michigan. On the East Coast, on the other hand, Norman Smith has encountered mostly healthy, normal-weight young owls at Logan Airport in Boston. What we’ll have learned by the end of the winter of 2015-16 will be another interesting chapter in the Project SNOWstorm story. 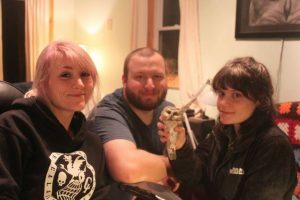 While the work that our team of collaborators has been doing feels new and exciting in this age of electronic communication, we are really standing on the shoulders of giants who have worked with Snowy Owls and other raptors for years. This blog is the first in what will be an irregular series about those that have come before us, and to whom we owe a large debt of gratitude for laying the foundation that we are building on. Statewide Snowy Owl banding totals for the period 1960-2014. Data from the U.S.G.S. Bird Banding Laboratory. Those groundbreaking ornithologists and citizen scientists did not have the technology that we possess today, but they used tried-and-true bird banding techniques, and a big dose of creativity, to learn about the winter ways of Snowy Owls. Looking into the Bird Banding Laboratory’s database, it quickly becomes obvious that prior to the irruption of 2013-14, there are four states in the lower 48 that have been the centers of winter Snowy Owl banding. Each of these states has its own history and key researchers whose passion brought us to where we are today. In many ways the story of Snowy Owl winter research (and the antecedents of Project SNOWstorm) begins in my home state of Wisconsin — not in 2013-14, but in 1960-61 when I was only 6 years old and had no idea what a Snowy Owl was. During that winter there was, as in 2013-14, a huge irruption of Snowy Owls into Wisconsin. 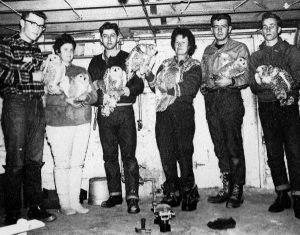 That inspired Fran Hamerstrom, then president of the Wisconsin Society for Ornithology (WSO), and a group of adventurous raptor banders including Dan Berger, Helmut Muelller and Chuck Sindelar, to conduct “Operation Snowy Owl” (Hamerstrom and Hamerstrom 1960; Hussong 1960). 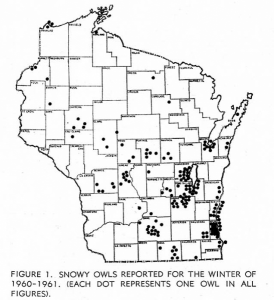 Distribution of Snowy Owls reported in Wisconsin during the winter of 1960-61. Map courtesy of the Wisconsin Society of Ornithology Passenger Pigeon (see Sindelar 1966). Together they and their colleagues conducted the first coordinated effort to study the winter irruption and subsequent distribution of Snowy Owls on a regional scale. 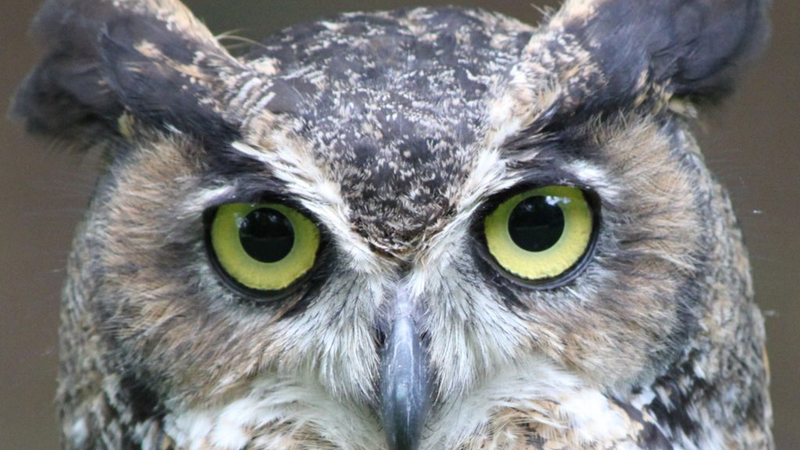 There were no GPS-GSM transmitters capable of tracking an owl’s movements, so they use spray paint to color-mark the white feathers of the owls they trapped and banded. Left to right, Fran Hamerstrom, Dan Berger, Cynthia Schachter and Nancy Mueller spray painting a Snowy Owl in a suburban basement. Image courtesy of The Iowa State University Press Ames Iowa, photo taken by Orvell Peterson. In the 1960s, information traveled far more slowly than today, relying on post cards, letters, and phone calls. In many respects, Project SNOWstorm is simply a modern-day incarnation of Operation Snowy Owl — one conducted on a much wider scale, using nearly instantaneous methods of communication, cutting-edge tracking technology, and engaging a larger and more widespread set of collaborators. Birding With a Purpose (1984), image courtesy of The Iowa State University Press, Ames Iowa. Most of the stories that these pioneering Snowy Owl banders have are quickly disappearing as the aging participants pass away. 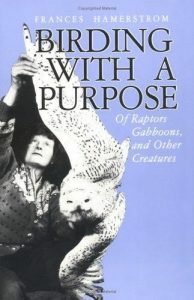 Fortunately, Hamerstrom recorded some of them in her book Birding With a Purpose, in which she devotes three chapters to some of the antics associated with field research in the 1960s. If we’d met any of the participants in Operation Snowy Owl that winter, I suspect many of us would have the same reaction as did one county sheriff, whose conversation with Fran is retold in the book. “Berger. He’s a good scientist and he runs a laundromat down in the Milwaukee slums,” Hamerstom replies. The sheriff then asked if he could become a “gabboon” — Fran’s term for the young apprentices that she and her biologist husband Frederick employed on their many research projects. She was only half-kidding when she granted the officer “probationary” gabboon status. He may not have realized what he was in for. 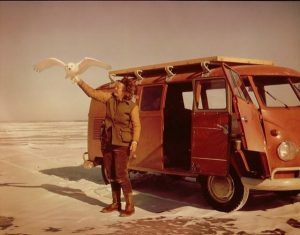 Among the antics from those early winters, which Fran recalled, were dropping Volkswagon buses through thin ice on lakes in east-central Wisconsin while trapping Snowy Owls for banding — not just once, but multiple times, sometimes with visiting foreign researchers along for the ride. Fran Hamerstrom releasing a Snowy Owl on the ice of a east central Wisconsin lake during the winter of 1960-61. Image courtesy of the Cedar Grove Ornithological Research Station archives, photo taken by Tom Meiklejohn. Fran Hamerstom was Aldo Leopold’s only female graduate student. She followed Frederick from Boston to the prairies of central Wisconsin to save the Greater Prairie-chicken from extirpation in the Badger State — which they did. In the process the two of them left a rich legacy of wildlife research, not just for the work on “chickens” but also for Fran’s work with Northern Harriers (detailed in her book, Harrier, Hawk of the Marshes) and other raptors. 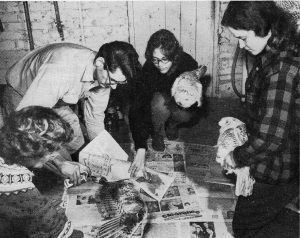 Fran’s Snowy Owl banding work occurred between 1961 and 1974 when she banded a total of 67 owls. Together these two ornithologists trained a long list of successful ornithologists and field workers. A Snowy Owl caught on the Fond du Lac, Wisconsin dump. The pigeon – after a moment of panic – has resumed eating corn in the trap. Image courtesy of The Iowa State University Press Ames Iowa, photo taken by Tom Meiklejohn. The team that conducted Operation Snowy Owl were pioneers in many ways. 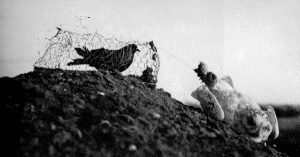 The trapping methods they developed are still widely used, such as using noose traps known as bal-chatris to capture Snowy Owls, and using nylon stockings or tubes to hold raptors safely during banding. While painting owls may seem crude to us now, it was used very successfully by these intrepid researchers back in the 1960s. 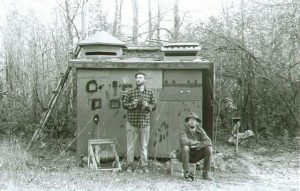 Helmut Mueller (left) and Dan Berger (right) in front of the original Cedar Grove Ornithological Research Station hawk trapping blind in 1950. Image courtesy of the Cedar Grove Ornithological Research Station archives, photo taken remotely by Helmut Mueller. Two other important players in Operation Snowy Owl were well-established Wisconsin raptor researchers in their own rights. The Cedar Grove Ornithological Station, along the Lake Michigan shore a short drive north of Milwaukee, had originally been started by ornithologists from the Milwaukee Public Museum in 1935. World War II interrupted research there, but in 1950 Dan Berger and Helmut Mueller revived the effort to count, trap, and band raptors at Cedar Grove. The station has operated every year since (for a history of Cedar Grove, click here). Over the years this field research station has banded over 43,000 raptors, produced a long list of scientific papers, and trained many young field ornithologists, including introducing Fran Hamerstrom to raptor trapping techniques. And not too surprisingly, they even banded a Snowy Owl at Cedar Grove. Between 1960 and 1993 Dan Berger banded 39 Snowy Owls. Helmut Mueller’s Snowy Owl banding work occurred during 1960-61 when he banded 12 owls. Other ornithologists that were introduced to raptor research through Cedar Grove include Chuck Sindelar, another member of Operation Snowy Owl, and Tom Erdman – Curator of the Richter Museum of Natural History at the University of Wisconsin Green Bay, who would go on to band 41 Snowy Owls in and around Green Bay Wisconsin, as well as mentor both myself and another Project SNOWstorm collaborator, Eugene Jacobs. Sindelar, an experienced eagle bander, went on to be one of the key individuals in monitoring the recovery of the Bald Eagle in Wisconsin. Between 1966 and 1974 Chuck would band 28 Snowy Owls in Wisconsin and another 19 in Minnesota. Chuck also sponsored and trained a young man who would become an important Snowy Owl bander in the Duluth, MN, area — Dave Evans. Most of the nearly 500 Snowy Owls that have been banded in Minnesota since 1974 are thanks to Evans’ efforts. 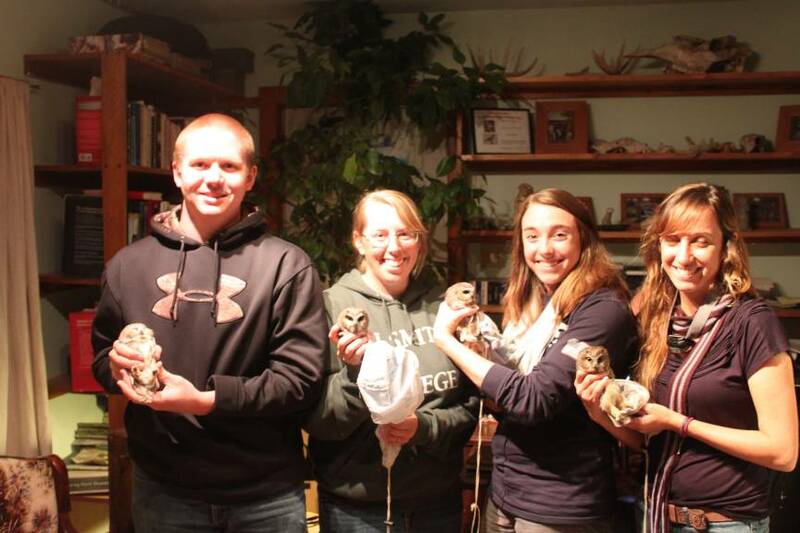 The Wisconsin total of over 425 owls is largely the result of Operation Snowy Owl and several other banders. There are two other individuals that in combination have banded more Snowy Owls in Wisconsin than any of the others – Don Follen and his associate Kenneth Luepke. Follen banded between 1964 and 1987 and, after Follen passed away, Luepke continued Don’s work through 2003. 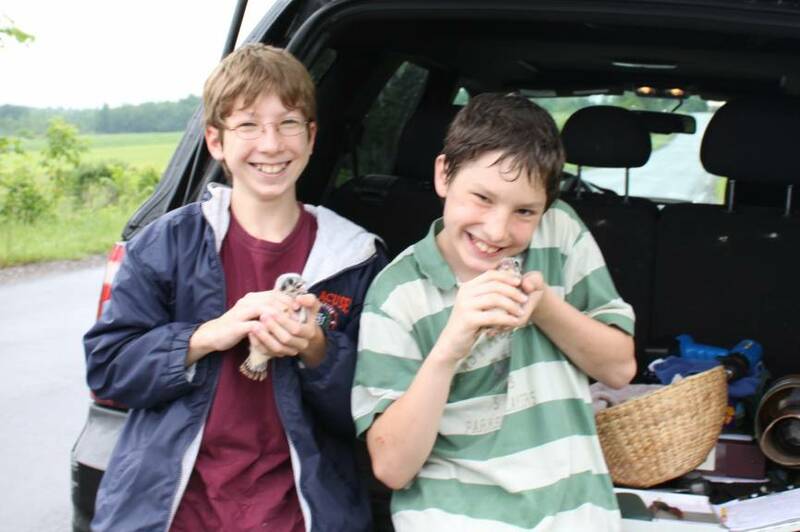 These two citizen scientists, working west of the Wisconsin River in west central Wisconsin, banded a total of 174 Snowy Owls, just over 40% of the Wisconsin bandings to date. A record catch of Snowy Owls during the winter of 1960-61 in Wisconsin. From left to right, Errol Schulter, Tanya Schulter, Chuck Sindelar, Fran Hamerstrom, Paul Drake and Alan Jenkins. Image courtesy of The Iowa State University Press Ames Iowa, photo taken by Orvell Peterson. So, what were the results from Operation Snowy Owl? While documenting 162 Snowy Owl observations across Wisconsin in a single winter was no small accomplishment (Sindelar 1966), in total the team banded 58 Snowy Owls that winter, laying the foundation for those to come. There’s a direct line from Operation Snowy Owl to Project SNOWstorm. It’s no coincidence that the second Snowy Owl fitted with one of Project SNOWstorm’s GPS-GSM transmitters was trapped by Eugene Jacobs, a central Wisconsin raptor expert who can also trace his roots back through Tom Erdman, Cedar Grove, and the Hamerstorms. Even more fittingly, the owl that he trapped back in December 2013 was Buena Vista, named for the grasslands in the heart of Wisconsin’s prairie-chicken range, only a few miles from the Hamerstroms’ home. In the best tradition of Operation Snowy Owl, Project SNOWstorm collaborators will be out and about this winter, continuing our efforts to better understand this charismatic owl. Future blogs will chronicle the foundational work of key players in Snowy Owl research from other key states, some of whom are among SNOWstorm’s most active partners. Hamerstrom, F. 1984. Birding with a Purpose. Iowa State University Press. Hamerstrom, F. and F. Hamerstrom, 1960. Operation Snowy Owl. Passenger Pigeon 22:126-128. Hussong, C. 1960. Operation Snowy Owl in Green Bay. Passenger Pigeon 22:129. Sindelar, C. 1966. 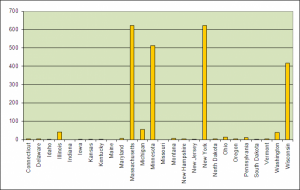 A comparison of five consecutive Snowy Owl invasions in Wisconsin. Passenger Pigeon 28:103-108. 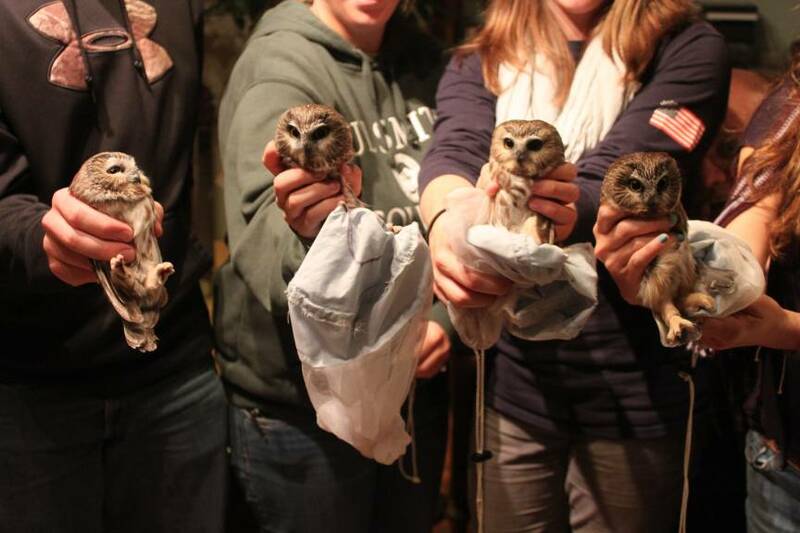 The 2015 saw whet owl season started on 20 September and we intend to close the nets on 6 November. The nets are opened 0.5 hours after sunset and run until there are no more owls or (if there is no activity) 11:00 PM. The 5th saw whet owl season will start on 20 September 2015. We are gearing up for another awesome season. Last year one of our banded owls ended up 15 miles west of the Liberty Bell near Philadelphia, PA. We cannot wait to hear where our birds end up this season.